Sovietspeak is still alive and well, it seems. The Russian Foreign Ministry is claiming that the nearly 20 Aleppo aid convoy trucks reportedly hit by airstrikes outside Aleppo yesterday (see below) weren’t in fact: they claim, they simply ‘caught fire’. Brezhnev – and indeed Stalin – would have been proud of that line. Which suggests that the prospects for an end to the fighting are a lot slimmer – and the consequences of this considerably grimmer – than intimated by mainstream media portrayals of the Syria conflict. In the midst of all this, particularly with respect to the UN’s hapless role in the conflict, combined with official – in this instance meaning Russian/Syrian government forces’ – aerial bombing of civilian targets, I continue to be haunted by the eerie parallels with the final stages of the Sri Lankan conflict. If confirmed, the claim of direct Russian involvement in the bombing that killed at least 20 people in Syria would have far-reaching consequences. US defence officials now believe that Russian planes dropped the bombs that destroyed a UN aid convoy and killed at least 20 people, the Guardian has learned. The claim of direct Russian involvement in the bombing, if confirmed, would have far- reaching consequences. Earlier on Tuesday, Ban Ki-moon used his farewell address to the UN general assembly to denounce it as a “sickening, savage and apparently deliberate attack”, describing the bombers at “cowards”, and UN officials have said it is a potential war crime. The outgoing secretary general told world leaders in New York that the UN had been forced to suspend aid convoys in Syria because of Monday’s attack on Syrian Red Crescent trucks that were carrying UN food supplies to a rural area west of Aleppo city. Victims of the attack included the local director of the Syrian Arab Red Crescent, Omar Barakat. Ban hailed the dead aid workers as heroes and said “those who bombed them were cowards” before calling for accountability for crimes committed in the war. “Just when you think it cannot get any worse, the bar of depravity sinks lower,” he said. Aid officials said the convoy was hit from the air while food and medicine were being unloaded at a warehouse in opposition-controlled Urem al-Kubra. 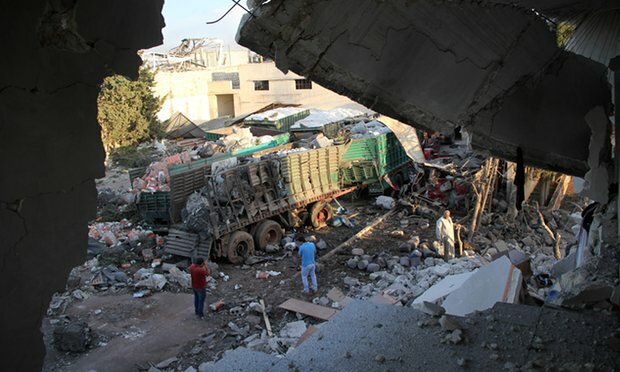 Reuters news agency quoted two US officials as saying two Russian Sukhoi SU-24 warplanes were in the sky above the aid convoy at the precise time it was struck. The White House and state department said they could not confirm the allegations, while the Russian foreign ministry rejected them with “resentment and indignation”. Previously, US officials had said that they would hold Moscow responsible for the attack, even if it was carried out by Syrian aircraft, as Russia had taken responsibility for the regime’s compliance with the ceasefire as part of the 9 September agreement. But Moscow has not conceded that the convoy was hit by an airstrike, claiming instead that the 18 lorries had “caught fire”. In a separate statement on Tuesday, the country’s defence ministry said that the aid convoy had been accompanied by a militants’ pickup truck armed with a heavy mortar, Russian news agencies reported. The US officials said there was no doubt the convoy was destroyed in an airstrike and that western coalition forces had no role in it. “There are only three parties that fly in Syria: the coalition, the Russians and the Syrian regime. It was not the coalition. We don’t fly over Aleppo. We have no reason to. We strike only Isis, and Isis is not there. We would leave it to the Russians and the Syrian regime to explain their actions,” said Capt Jeff Davis, a Pentagon spokesman. In a meeting with John Kerry, Sergei Lavrov, the Russian foreign minister, admitted that the Russian military had been monitoring the convoy – apparent drone surveillance footage of its progress had been live-streamed on a defence ministry website . But he claimed the Russians had “lost track of it when it entered rebel territory”, according to diplomatic sources. Moscow had launched an investigation, Lavrov told the other foreign ministers. Later on Tuesday, however, the Russian foreign ministry put out an angry denunciation of allegations against Moscow and Damascus. “We are considering, with resentment and indignation, attempts by some foreign curators of rebel units and terrorists in Syria to put the blame for the incident on the Russian and Syrian air forces who allegedly bombarded a relief convoy,” the statement said, according to the Tass news agency. Despite the outrage caused by the attack, and the continued bombing of rebel-held areas of Aleppo, the US and Russia have refused to declare the Syrian ceasefire dead. Lavrov’s meeting with the US secretary of state was the first since the Syrian military declared itself no longer bound by the ceasefire the two politicians negotiated, and resumed its air campaign against eastern Aleppo and other rebel-held areas on Monday. “We are going to continue to work. We are going to meet again Friday on some specific steps,” the secretary of state said. The UN later retreated from the claim that the convoy had been targeted in an airstrike. “We are not in a position to determine whether these were in fact airstrikes. We are in a position to say that the convoy was attacked,” its humanitarian spokesman, Jens Laerke, said. The ISSG foreign ministers are due to convene again on Friday, though diplomats said the session could be brought forward to Thursday evening, as fighting intensified in Syria. The bombardment of eastern Aleppo continued until 2am on Monday, according to reports from the city. At least 39 civilians were killed overnight in Aleppo and the surrounding province, the Syrian Observatory for Human Rights monitoring group said, compared with 27 killed over the whole week when the truce was precariously in force. In another incident late on Tuesday, four medical workers were killed and a nurse critically injured in an airstrike that hit a clinic in a village near Aleppo. The clinic in Khan Touman was completely levelled in the strike and more dead were feared to be buried under the rubble, the aid group that supports the clinic said. The Syrian Observatory for Human Rights monitoring group said Syrian or Russian warplanes carried out the raid. The UN special envoy, Staffan de Mistura, said that none of the foreign ministers in the ISSG meeting had wanted to call an end to the ceasefire despite the renewed bombing, and the attack on the food convoy. De Mistura described the targeting of the convoy as “outrageous” and hoped it would turn out to be “a gamechanger that will help Friday be a serious meeting about how to reinstall the cessation of hostilities [and] humanitarian aid”. The UN emergency relief coordinator, Stephen O’Brien, said that if it was found the convoy had been deliberately targeted, it would constitute a war crime. Robert Mardini, the ICRC director for the Middle East and north Africa, confirmed that Barakat, the Aleppo director for the Syrian Red Crescent, was among the dead. Plans for aid convoys to rebel-besieged Foua and Kefraya in Idlib, and government-blockaded Madaya and Zabadani near the Lebanese border, had been put on hold, he said. The US state department spokesman John Kirby said that the US, Russia and other ISSG ministers had agreed to keep up attacks on Islamic State and Jabhat Fateh al-Sham, formerly the al-Qaida affiliated al-Nusra Front, “while recognising the difficulties of separating al-Nusra from the moderate opposition in some areas of the country”. “They emphasised, in this context, the imperative of ending indiscriminate aerial bombardment of civilians, which is exploited by terrorist groups. And they stressed the absolute criticality of creating the conditions necessary to resume UN-led political talks in coming weeks,” Kirby said.